England's Alastair Cook, left, and team-mate Joe Root wait for a new ball to be given to India at The Oval yesterday during their unbroken stand of 50 on day three of the fifth and final Test (Picture: John Walton/PA Wire). Alastair Cook can dream of a 33rd Test century in the final innings of his record-breaking career after steering England to stumps against India at The Oval. Cook was still battling away unbeaten, on 46, as he so often has throughout his 161 Tests, in a total of 114-2 as England extended their overall lead to 154 after bowling India out for 292. Home advantage on day three of this fifth Specsavers Test would have been still more substantial without the revival engineered by India’s charismatic all-rounder Ravindra Jadeja (86no) and Hanuma Vihari (56). The tourists resumed on 174-6 and appeared sure to trail significantly until the seventh-wicket pair took their stand to 77, and 132 were added in all for the last four to fall. As Cook then set out to consolidate, he was cheered and clapped to the middle by his fourth standing ovation of the week here – before a handshake from India captain Virat Kohli as he prepared to take guard. He soon lost his opening partner Keaton Jennings, in worrying circumstances as the man still expected to try to form the backbone of England innings into this winter and perhaps beyond shouldered arms to Mohammed Shami and lost his off-bail. It was an unedifying end to Jennings’s largely fallow Test summer with the bat, especially after he had earlier dropped the catch at short-leg that reprieved India No 11 Jasprit Bumrah and cost England 32 runs. Cook spent 26 balls stuck on 13 either side of tea. But he uncovered occasional fluency, in an unbroken 50 stand with his captain Joe Root after Jadeja had spun one through the gate to bowl Moeen Ali, and there were no major alarms to the close. As has been the curious case throughout this match so far, bat dominated ball before lunch, thanks to Jadeja and Vihari this time. James Anderson, still three wickets short of overhauling Australia great Glenn McGrath’s world record of 363 for any pace bowler, drew a blank alongside Stuart Broad. Debutant Vihari, who would have been lbw for nought to Broad the previous evening if England had gone to DRS, completed his half-century from 104 balls. It took Jadeja, returning here for his first Test of the series, nine deliveries more and into the afternoon before he cut Moeen for his seventh boundary to reach the same milestone. Vihari’s dismissal, caught-behind pushing up the line as Mooen’s arm ball drifted across him, was the only one before lunch. Ishant Sharma went in near action replay to Moeen in early afternoon, and then Shami got greedy against Adil Rashid and holed out at long-on. Jadeja would have been left stranded at 260 all out if Jennings had held a sharp catch off bat and pad when Rashid’s googly was too much for Bumrah. But he did not and Jadeja, who had celebrated his 50 with a trademark swish of his imaginary Rajasthan warrior’s sword, cashed in as the buccaneering presence in a last-wicket stand. 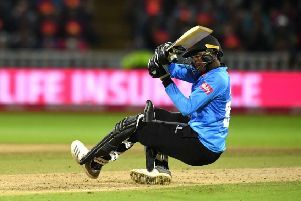 As Root’s field placings and bowling changes sent out mixed messages, Bumrah faced only 14 out of 54 deliveries – and Jadeja memorably smashed the second new ball straight back over Anderson’s head for six. India’s fun, and England’s frustration, finally ended when Bumrah was run out chancing a tight single. Then, of course, it was over to Cook – for one last time.